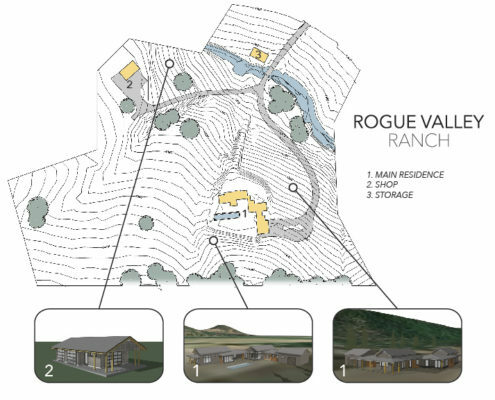 Designing this home required a plan to re-contour a poorly sloped home site so that the new home could be nestled into the natural meadow that surrounds it and takes advantage of the views across the lower alfalfa fields, which border the adjacent river. The design for the home and shop incorporates contemporary farm house aesthetics with open and covered porches for outdoor living space. 20 years ago, this client designed and constructed an innovative house that adopted the then-current health standards for toxicities in construction. They continued with that ethos in this new construction project and all the improvements with today’s standards. The shop was constructed first to provide a retreat space while the residence is being completed. Once the home is constructed, it will be used as an away-structure for shop work and yoga.